The Utility Billing Department is your first contact when establishing a utility account for water, sewer and or garbage collection services with the City of Eastland. 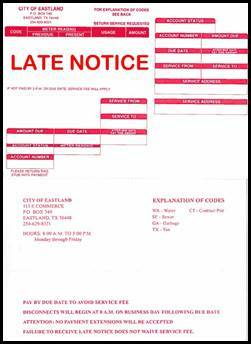 RESIDENTIAL UTILITY ACCOUNT for water, sewer and or garbage collection with the City of Eastland print and complete this Application Form and submit it by fax, email or in person with a copy of your current driver’s license. If renting or leasing, a copy of the signed rental/lease agreement, plus the deposit ($200) and connection fee of ($25) are required. For Residential Owners there is a $150 deposit and $25 connection fee. New businesses wanting to establish a utility account should download and complete the Commercial Water Service Application form and contact us for a deposit quote. You may then fax, email or bring the application form and required fees to us. Fees may be paid by phone with a credit or debit card*. Sewer: Rate is based on usage of water at .81 per 1000 gals after first 2000 gals. Garbage: These fees are based on the size of the container and the number of pick-ups per week. Please contact City Hall for this information. Customers are billed monthly for their city provided services based on usage from the 15th of the month to the 15th of the following month. Bills are mailed on the last day of the month and are due by the 20th. Late bills are mailed on the 21st day and have a Due By date. Cutoffs are processed the following day. 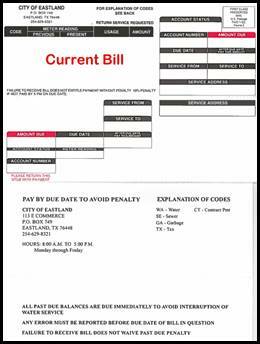 Utility payments may be mailed to us, brought to Eastland City Hall in person during regular business hours or placed in the night deposit box located at the front entry. The box is worked at 8 a.m. each business morning. PLEASE do not place CASH in the night deposit. We accept cash, check, money orders, certified funds as well as Mastercard and Visa credit cards and bank debit cards. We do not accept American Express or Discover. 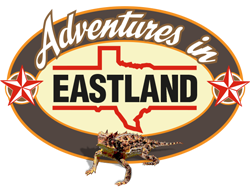 The City of Eastland, as a convenience to our customers, offers a monthly Average Billing program as well as automatic bank drafting. Call or stop by and ask us about these services. Contact: Michelle Riley, City of Eastland.